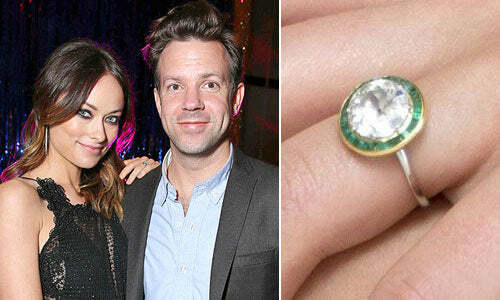 Actress Olivia Wilde is engaged to comedian and actor Jason Sudeikis. Sudeikis, 37, and Wilde, 28, have been dating since November 2011. We got a glimpse of Olivia Wilde’s engagement ring recently and we love it! The couple became engaged soon after the holidays and her engagement ring is rumored to be an antique engagement ring. We can’t wait to see a clearer photograph of her ring. Sudeikis made a wise decision to choose a ring as classic in appearance as his bride-to-be. This will be a second marriage for both. Wilde eloped with Italian prince Tao Ruspoli when she was 18. The marriage ended when she was 27. The SNL alum Sudeikis was married to Kay Cannon, a writer-producer for 30 Rock from 2004 until 2010. The wedding plans are under wrap for now, but we are wishing this couple nothing but the best.